In 1967, astronomers began receiving and cataloging precisely timed radio pulses from extraterrestrial sources, which they called pulsars. These pulsars emit laserlike radio beams that penetrate through space much like searchlight beams. Paul LaViolette, who has been researching pulsars for over 25 years, shows that while these pulsars have long been assumed to be spinning stars, the true nature of these radio sources has been grossly misunderstood. 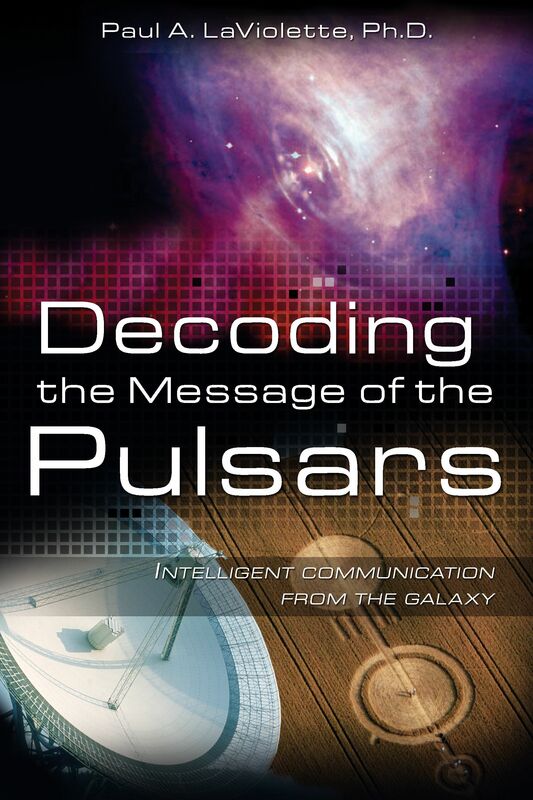 In Decoding the Message of the Pulsars, LaViolette shows that pulsars are distributed in the sky in a nonrandom fashion, often marking key galactic locations, and that their signals are of intelligent origin. Using extensive scientific data to corroborate his theory, he presents evidence of unusual geometric alignments among pulsars and intriguing pulse-period relationships. Equally compelling is the message LaViolette contends is being sent by these extraterrestrial beacons: a warning about a past galactic core explosion disaster that could recur in the near future. If pulsars are beacons that have been fabricated by technically advanced extraterrestrial civilizations, their existence would have some very profound implications. Not only would it indicate that intelligent life exists elsewhere in the Galaxy, but also that it exists in numerous parts of the Galaxy. To carefully craft a distribution of pulsars that stretches out over a distance of more than 100,000 light years, civilizations in these diverse locations would have to be in close cooperation over a comparable duration of light-travel time. Not only does this require a functioning Galactic communication network, a kind of “Galactic internet,” it also requires a very long-term collective commitment by these civilizations. The task of orchestrating an organized pulsar array covering such vast distances would only be possible if these civilizations either had developed the means for faster-than-light space travel or the means of communicating among themselves at speeds far greater than the speed of light. If superluminal travel is possible, it is unlikely that it would be accomplished with conventional rocket technology. Rather, more likely it will involve a method of controlling gravity fields. One area that shows great promise in the development of such field propulsion technology is the discipline called electrogravitics. This field, which was pioneered in the early twentieth century by physicist and inventor T. Townsend Brown, exploits the subtle interrelation between electric and gravitational fields. Brown demonstrated that when a capacitor is charged to a sufficiently high voltage, it will experience a gravitational thrust in the direction of its positive pole. The aerospace industry began an intensive study of this phenomenon back in the mid-1950s, and there is an indication that the B2 bomber incorporates an electrogravitic drive based on ideas described in Brown’s patents. In the future, using this technology, our civilization may be able to construct spaceports harboring immense gravity beam projectors whose beams would be large enough to envelop an entire spaceship, thereby making trips over a distance of several hundred light years possible in a matter of days. Perhaps a network of such spaceports is already in operation in our Galaxy. If extraterrestrial civilizations have in fact developed spaceflight, they would need a means for charting their course through the Galaxy. One might consider, then, whether the primary function of the pulsar network is for use in space navigation. It might function something like our own Global Positioning System. Interestingly, NASA scientists used the pulsar network for navigation purposes when they sent out their ET communication message on board the Pioneer 10 spacecraft. As described earlier, an alien civilization coming across Pioneer 10 and its space plaque could locate the craft’s Earth-based point of origin by identifying the particular pulsars designated on the plaque. In a similar fashion, by locking onto the signals of several pulsars, a spaceship could accurately locate its instantaneous position in the Galaxy. If one is not prepared to accept the possibility that civilizations might cross such vast stretches of interstellar space at superluminal speeds, one might still consider the possibility that they could share information among themselves at superluminal speeds. In 1991, Thomas Ishii and George Giakos reported that they had transmitted microwaves at faster than light speeds. Shortly afterward in 1992, Enders and Nimtz, physicists at the University of Cologne in Germany, described transmitting microwaves at superluminal velocity. This work became more widely known after 1995 when this group succeeded in transmitting Mozart’s 40th symphony through an undersized 11 centimeter long waveguide at a speed 4.7 times faster than that of light. Other physicists have been exploring the possibility of using quantum-entangled photon pairs as a way of sending information virtually instantaneously from one point in space to another. Earlier researchers had explored a far less sophisticated technique that could transmit messages over great distances by means of longitudinal wave shock fronts. Physicist T. Townsend Brown, for example, developed a communication device that generated its signals by repeatedly charging a capacitor to a high-voltage and abruptly discharging it through a spark gap. The resulting energy shock fronts were received by an electrified capacitor bridge that registered these waves as voltage transients read by means of a Brush chart recorder. An investigator from the Office of Naval Research who witnessed a test of this device in 1952 reported that signals were successfully transmitted to a receiver located in an adjoining room within an electrically grounded metal shield. An article printed in Inter Avia magazine in 1956 indicated that Brown suspected that the waves being transmitted were not limited by the speed of light, although at the time he had no definitive proof of this. Since he had determined that his capacitor bridge was able to detect gravitational disturbances, he concluded that the signals he was conveying must be gravitic, rather than electromagnetic. He reasoned that the waves were the gravitational homologues of light waves. In further support of his gravitic hypothesis, he found that he obtained even better reception if he replaced the two titanium oxide capacitors in his bridge circuit with ceramic capacitors that had both a high mass density and high dielectric constant. Existing experimental evidence suggests that faster-than-light communication is definitely possible in the laboratory. Assuming that communicators can be built to transmit superluminal signals over interstellar distances, message time lags between civilizations would be minimal, thereby making an integrated Galactic internet possible. Perhaps the Hertzian electromagnetic emissions from pulsars contain a non-Hertzian superluminal component, as yet unidentified, that permits such rapid communication. Now that we’ve identified that superluminal communication is possible, let’s explore just what messages extraterrestrial civilizations may be trying to transmit. Paul A. LaViolette, Ph.D., is president of the Starburst Foundation, an interdisciplinary research institute, and holds advanced degrees in systems science and physics. The author of Genesis of the Cosmos, Earth Under Fire, Decoding the Message of the Pulsars, Secrets of Antigravity Propulsion, and Subquantum Kinetics, he lives in New York. ". . . in an age in which few astrologers can actually cast a chart by hand, let alone identify the Zodiacal Signs in the night sky, LaViolette's ability to demonstrate profound scientific knowledge as well as astrological understanding is impressive." "[This] book is oveflowing with documented scientific explanations of how supernovae, which have extremely consistent and regular pulses of radio waves, have a high possibility of being of intelligent origin." "Now be warned, this is a very technical book. About half of it is the evidence proving what he's saying, and honestly I think someone needs to listen to this guy! The other half is more digestible for non-astronomy prone individuals. So buy the book, and just take it slow. His research is footnoted, cataloged and needs to be talked about." " . . . reveals a vast body of scientific evidence that will give you a firm foundation for looking further over the horizon of human understanding."